Designed for the gruelling schedule of daily firing of full loads. 22½" x 29" deep, its 7.10 cubic foot capacity is a very sensible studio size, taking good loads of everyday items, but also able to cope with the massive, (high profit!) platters, or a mountain of smaller plates! The Paint Your Own Pottery studios... ...often opt for the Studio Two ceramic kiln when they are looking to increase their firing capacity, and want a larger kiln to compliment their primary kiln, (usually Studio1). You may be surprised to see the increase in capacity will not have a significant impact on either the firing time or the firing cost, making for a fast turn-round of a high volume of ware. 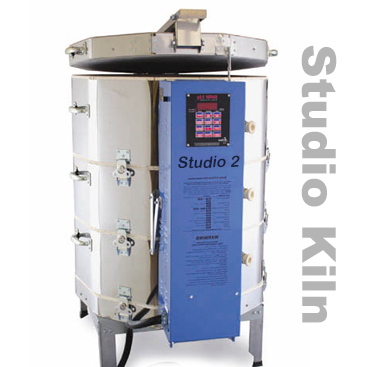 Alternatively a Contemporary Studio may consider a Studio 2 kiln as a perfect overflow from a larger kiln they may already have, for those odd slack days when you cannot fill your larger model... A great 'Midway kiln'! There are many mobile Pottery Painting businesses who regularly fill a Studio Two kiln when they are doing adult parties, hen parties, or several childrens parties at a time. Treat with care and this kiln will give years of firing with a minimum of maintainance. The high fire elements are made from the finest alloy available, and they are very deeply seated in the specially cut firebricks, not conspicuously laying in open grooves where they can be so easily damaged by contaminats. As with all our kilns, when you do need spares we have them here ready for immediate despatch, not days of waiting for them to be made for you. This kiln will squeeze through a 32" door (just!) or can be dismantled to fit through almost any doorway. Hobby Ceramicraft studio kilns have withstood years of abuse in school environments. Ceramics teachers fire these kilns unmercifully, without remorse. Yet the kilns keep going. Studios swear by them! The top row of bricks in the Studio 2 are 2" high and without element grooves. This makes it is less susceptible to damage during loading than a grooved brick. Hinged at the bottom, the switch box opens forward for easy maintenance, accessing all of the working components in the kiln. A folding support arm holds the box in the open position. The computer controller is mounted at the top of the switch box within easy reach of the loader to program the kiln when the kiln has been carefully loaded. The 10-sided Studio2 comes in deluxe 3" thick brick walls, lid and bottom. The 3" brick is 20% thicker than the standard brick, giving extra insulation and allowing for higher firing temperatures to be attained. The 24" sturdy metal stand for kiln supports the brick bottom with framing that is 4 ½” wide across the top of each side. The stand is rock-steady, with 16-gauge frame and heavy 12-gauge legs. A heavy galvanized steel base covers the reversible brick bottom completely. Folding under the stainless case on each side strengthening the firing chamber. Another assurance that this Hobby Ceramicraft kiln is built to last. The advanced and extremely reliable computer controller continually monitors the firing so you can spend your time productively without closely watching the kiln. (Please remember, however, to check the kiln during firing and to monitor it near the expected shutoff time.) The sealed touch pad keeps out dust and is easy to wipe clean. The controller has powerful features that you will enjoy using and is also ultra user-friendly to operate. If you ever wondered how much electricity your kiln uses, the digital controller can figure this for you with the press of a button. Find out how little a kiln actually costs to fire. Learn to conserve energy by experimenting with firing speed, load density, etc. Please call us for more information and advice on any of our kilns. Or come and see us and take a look at the models we keep in stock before you buy. Comes with a years warranty on the kiln, 2 years on the computer, and our help and assisstance for as long as you need it,..
1 1/2" Square Posts, 8 each - 1", 2", 3", 4", 5", 6"
Cubic footage is not a very useful measurement in choosing the right cafe kiln, more useful is shelf width, i.e. how many 8", 10" or 12" plates can I load across the shelf?